The following Pokemon that will be used by Pokemon Trainer Colress will be chosen at random. Since no two Pokemon of the same species may enter, only one of the two possible Held Item and move sets will be chosen. Colress’ Roster focuses on durability as its strong point due to the numerous resistances covered by the following types. The Recommended types to use against Colress’ party Pokemon are Fighting, Fire, and Ground. However, caution is necessary when depending on Ground-Type moves since one of his Pokemons might be holding a Air Balloon. Muk (Alola) is also similarly troublesome when it has successfully buffed itself with Minimize. Therefore it is recommended to have a Pokemon that can take it out immediately before it has the chance to set-up evasion buffs. Another method is to use the move is the move Dragon Rush which benefits more as more Minimize buffs are factored in. Porygon 2, which has superior durability, can easily be defeated by taking away its Eviolite with Knock Off. Status support moves such as Reflect, Light Screen, Yawn, etc. can increase your team’s potential as it allows turns for setting-up buffing moves to survive the long enduring battles that his team’s durability capitalizes on. 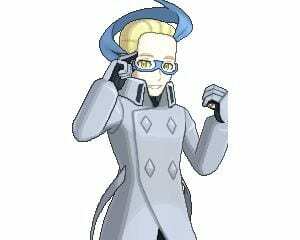 Similar to Wally, Colress also has a Magnezone with the ability Sturdy, thus at least one Pokemon with the ability Mold Breaker should be prioritized in your party.